How Houses Themselves Become Fuel For Wildfires Wildfires destroyed thousands of homes across California this year. Fire scientists are discovering that most homes burn down from blowing embers, sometimes long after the the fire has passed. 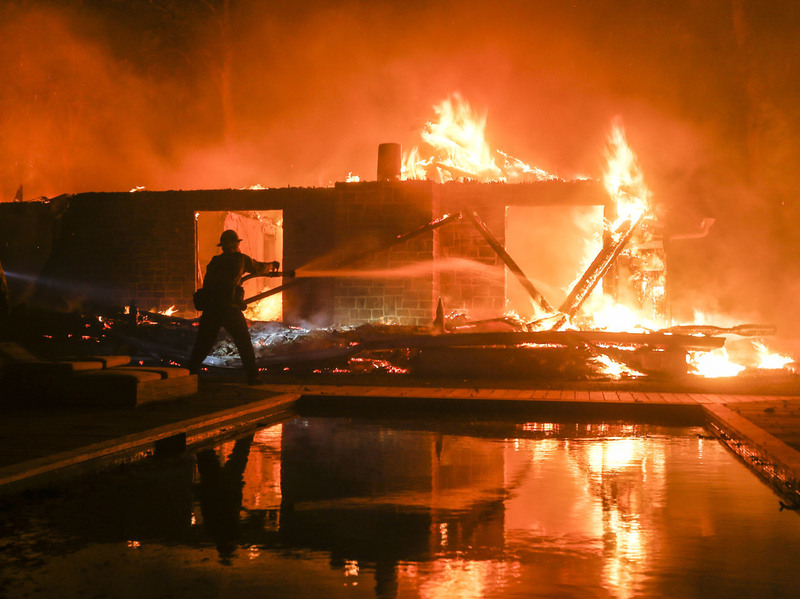 A firefighter battles the Woolsey Fire burning a home in Malibu, Calif. in November. Fire scientists are finding that homes most frequently burn from flying embers after the initial blaze has passed through. When firefighter and Malibu town councilman Rick Mullen got the call last month for the Woolsey Fire, he set in motion a plan his family had long practiced. While he and his crew mobilized to the front lines, his son stayed home and defended their house, even though they were under evacuation orders. His son and some friends were a small crew who knew what to do, had supplies to survive for days on their own, and they stuck to the plan. "It can be visually terrifying and if you don't understand fire behavior it can be panic inducing," Mullen says. "The reality is even though it looks bad you are in a very survivable position." They had well water they could pump. They kept an eye on embers landing on the roof or near the house and were able to douse them. And the family's home survived. "[They] executed the plan we'd been training on for years and they did a great job," Mullen says. This past year saw the most destructive wildfire season in California history, which is bringing attention to the emerging science around how and when homes burn during wildfires. There are stories like Mullen's from Malibu to Paradise, where the much larger Camp Fire destroyed more than 18,000 structures. Hundreds of homes were not lost however, some likely due to the fact that there was somebody there, watching over them, with a hose. "After that big fire front comes through, if there's nobody around, a lot of these homes can burn down," says Mullen. 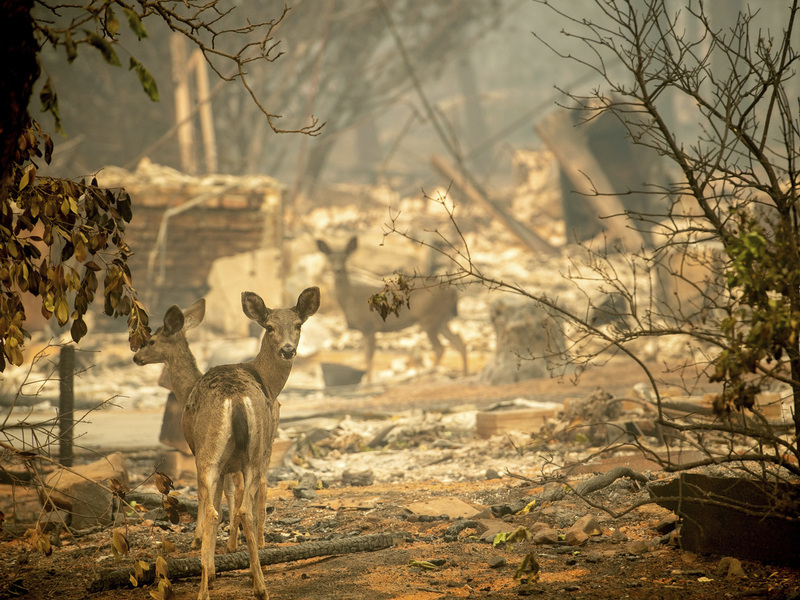 A deer walks past a destroyed home on Orrin Lane after the wildfire burned through Paradise, Calif. 14,000 residences were destroyed in the deadliest and most destructive wildfire in state history. It's long been a misperception that most homes burn when that initial big, dramatic wall of flames from the fire blows through. But the science shows most homes actually tend to burn long after this — sometimes even a day later. "We tend to pay attention to the flames, and that's not the biggest part of the problem," says Jack Cohen, a wildfire behavior scientist. Cohen, who pioneered home ignition research for the U.S. Forest Service, says the biggest problem is often the stray ember after the main fire that lands on some pine needles in a gutter, or on some outdoor furniture cushions. "If the homeowner is present then a little bit of water is quite effective in putting that smoldering combustion out," Cohen says. Cohen is not encouraging people to defy a sheriff's orders and stay behind to protect their home. But he is trying to get a conversation going about the reality around these new megafires. Many of these megafires may begin as forest fires, but they quickly burn into suburban developments and even whole cities. These become urban structure fires, jumping from one house to the next, and Cohen says our strategy in fighting them needs to be overhauled. "Why would we stay at the house?" Cohen asks. "Well, the bottom line there is that a house that doesn't ignite and burn is the safest place to be." Being inside a house that doesn't ignite — like one with fiberglass shingles and vents that embers can't squeeze into attics through — may be safer than getting stuck out on a road with thousands of people trying to evacuate. But right now, public officials like Rick Mullen in Malibu don't have the data that would allow them to identify homes or neighborhoods where people could safely shelter in place. "I'm not going to encourage anybody to stick around," Mullen says. "I accept the reality that some people do that, but the biggest responsibility for our public safety professionals is to save people's lives." Still, fire managers are keenly interested in the idea of creating more so-called 'stay and defend' communities. There are some examples of developments like this in Southern California that have shown some early success, and could serve as a model across the fire-prone West. Scientist Jack Cohen says a 'stay and defend' community doesn't have to be a neighborhood of houses made of concrete. "We don't necessarily need to build amo bunkers to live in in order to deal with this," he says. Instead, Cohen says, it's often just those little things left unattended that have the biggest consequences. It's the stuff right by the house, the debris in the gutter, the dried out hibiscus hanging in a planter. The area within five feet of the home and extending out which he calls the home ignition zone. "We're fighting against a culture and a perception of how the ignitions occur," Cohen says. Cohen says we need to stop fighting these mega fires like forest fires, and instead build or redesign neighborhoods that are more resistant to the urban fires that have become the norm.